One of the two scrap table runners I completed over the weekend, this would look much better on the table if I could even find the table!! 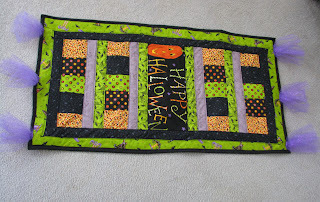 On my to do list for the weekend was to finish the scrap Halloween table runners, make a Roman shade for Daughter #1 with matching monogrammed towels for her powder room and can tomatoes. The tomatoes didn't happen but I was able to pawn off lots to the neighbors and some friends. I will still have to can a batch by tomorrow but for now I am done, there isn't an ounce of energy left in the body. The Roman shade turned out great but I forgot to take my camera with me tonight when we hung them :( I have to go back tomorrow and do a little touch up work on some flower arrangements Daughter #1 needs me to finish if I can remember I will get a shot of them. Here is a tip, it is cheaper to purchase window treatments than to custom make them and a heck of a lot less time consuming!!! The kitchen is in total disarray from all the sewing and what not over the weekend but I could care less, tonight I am headed to bed. I would put money on the fact it will all still be there in the morning. While we are on the sewing creating subject head over to Carla's blog http://halfdozendaily.blog.com/2011/09/11/blog-candy-giveaway/ to try your hand at some blog candy she is offering, everything is super cute, I have my heart set on the Eiffel tower cozie! I am thinking I need to do a little blog giveaway soon, maybe this week. You guys better figure out how to post a comment if you want to get in on the prize, I am thinking something Fallish or Halloween, need to dig around an come up with something. AJ the Beagle is driving me crazy, I think she is ready for bed as well, she has had a hard day of rabbit hunting and squirrel chasing today.